The first day of spring may not be a pleasant one, but at least it probably won't be as snowy as previously expected. The National Weather Service had predicted as much as four inches of snow could fall on Saturday afternoon into Sunday night. The service scaled back that total on Sunday, saying that the forecast called for 1-3 inches in Philadelphia. An alert warning of hazardous weather did say around 3-4 inches was possible in Atlantic City and other parts of New Jersey. 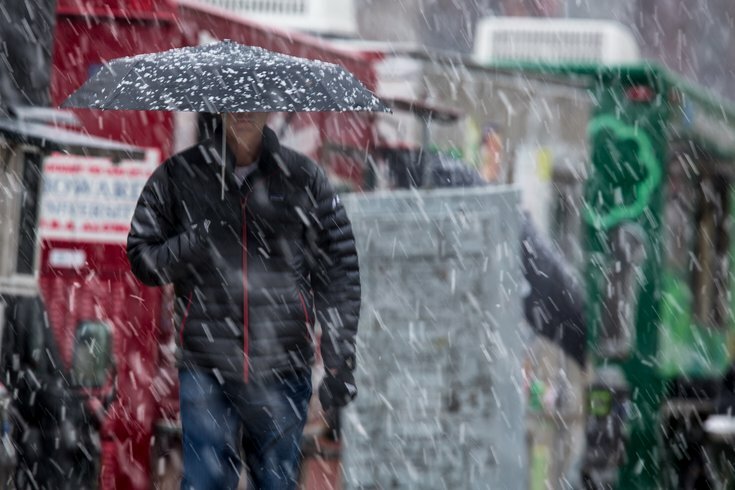 Snow began falling in Center City Philadelphia around 4:30 p.m., but the heaviest snowfall is expected to fall between 9 p.m. Sunday and 5 a.m. Monday. The probability for widespread hazardous weather is low, according to the NWS. Sunday: A chance of rain, mainly after 3 p.m. Cloudy, with a high near 42. Northeast wind 9 to 11 mph. Chance of precipitation is 30%. New precipitation amounts of less than a tenth of an inch possible. Sunday night: Rain and snow likely, becoming all snow after 11 p.m. Cloudy, with a low around 32. Northeast wind 8 to 11 mph. Chance of precipitation is 70%. New snow accumulation of 1 to 2 inches possible. Monday: A chance of flurries before 11 a.m. Cloudy through mid morning, then gradual clearing, with a high near 50. Northwest wind 7 to 12 mph increasing to 13 to 18 mph in the afternoon. Monday Night: Mostly clear, with a low around 33. Northwest wind 8 to 15 mph. Tuesday: Mostly sunny, with a high near 54. Southwest wind 6 to 13 mph. Wednesday: A chance of sprinkles. Partly sunny, with a high near 65. Thursday Night: A chance of showers. Mostly cloudy, with a low around 52. Chance of precipitation is 30%. Friday: A chance of showers. Mostly cloudy, with a high near 65. Chance of precipitation is 50%. Friday Night: A chance of showers. Mostly cloudy, with a low around 40. Chance of precipitation is 30%. Saturday: Mostly sunny, with a high near 56.